Trees serve many purposes for home owners: landscaping, curb appeal, and shade, to name a few. But sometimes, trees can become dangerous to your home and property; if a tree is leaning, becomes broken from a strong storm or wind, gets sick or dies, is infected with bugs or beetles, has many broken branches or other damage, or is rotting, it's safer and less costly to have the dangerous tree removed. It's important that you choose an experienced arborist - a profressional with lots of experience removing dangerous trees - to safely, efficiently, and neatly remove the dangerous tree. If a dangerous tree should snap and fall on your home or other property - like cars or outbuildings - it can cost many thousands of dollars to have the tree removed and the damage repaired. It is far more money-wise to proactively and pre-emptively remove a dangerous dead, leaning, or damaged tree before it causes damage to your home or property. If you have a problem tree that you need removed, don't hesitate to call The Tree Service. We can remove dangerous trees safely, efficiently, and with as little disruption to your life as possible. 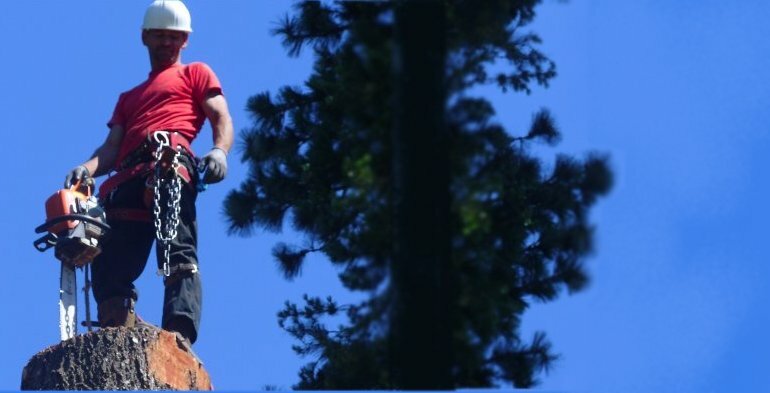 We have experience removing trees around buildings and on steep or otherwise difficult terrain, and will give you an honest assessment of your tree based on your situation as we can. Don't wait for a disaster: call The Tree Service today!